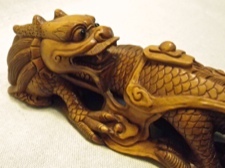 Chinese craftsman are famous for the elaborate detail in their traditional carvings and their deep appreciation for the virtue of the natural wood. 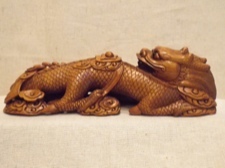 We are thrilled to have this amazing handcarved dragon as part of our gallery collection. 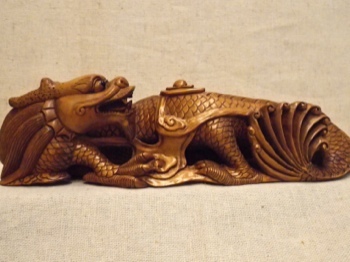 The carving is 8 inches long, 2.5 inches tall, and 2 inches wide. Interesting notes on boxwood trees - they are relatively small, slow growing, and mostly used for hedges; therefore most available pieces for artwork are small. 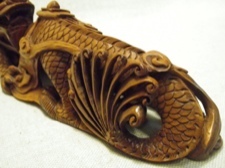 However the density, texture, fine grain, and color makes it a popular choice for fine carvings as this. Boxwood is also used for chess pieces, instruments and wood inlay.